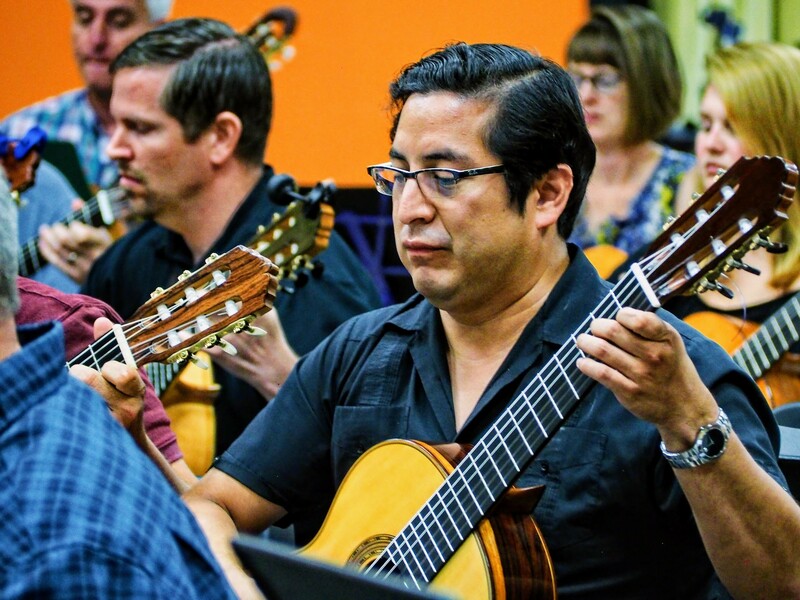 2017 was another tremendous year for Austin Classical Guitar and, especially, for ACG Education. In this year-end report, my aim is to connect news of growth and change in our services with the theories and innovations that we believe have helped thousands of diverse students and teachers experience authentic growth, personal satisfaction, and moments of true joy. What began in one school in 2001 has now spread to 60 schools in Austin and five surrounding districts, along with many partner teachers and organizations throughout Texas, the United States, and beyond. We are overwhelmed and grateful for the opportunities we have had to introduce a new course subject in American schools. In this context of significant growth, it is more important than ever for us to remain focused on the fundamental beliefs that have guided us from the very beginning: that there is joy in music-making; that expressive and beautiful playing happens from the very first day; that music has the life-changing power to instill pride through hard work and accomplishment. Thank you for supporting ACG Education. All that we have done, we have done with you. And our work is just beginning. On behalf of all of us at ACG, thank you for believing in us, and thank you for your faith in the power of music to change lives. At the core of everything we do in ACG Education is our belief that learning should lead to experiences of deep personal significance. Our curriculum, our teacher training, our teaching, and our social services are all conceived with this belief in mind. I have been playing guitar since my first year at Lamar in the 6th grade. I picked up on it relatively fast, and was transfixed by it immediately. As the years went by I continued to improve and fall in love with the instrument. There aren’t many pastimes I consider better than strumming away on the guitar in my room. The instrument has also helped me personally with goal-setting and self-improvement, as I’m able to practice different songs I want to learn on my own. I truly appreciate all that ACG has helped me to accomplish and learn. This young person’s words encapsulate the principles of 5-EE. In this case we have a window into a years-long process and its profound results. But we have learned that a large impact such as this is a product of 5-EE playing out in the microcosms of each classroom, each day, each rehearsal, and each frame of learning within each rehearsal. Promoting 5-EE teaching is challenging in the context of growth because we are dealing with expanding resources and many individual teachers across varied communities. Take just the first step: to establish an environment that promotes a sense of safety, and belonging, and gives room for mistakes. This is difficult! We can all think of teachers in our own past who did not do this well. Fortunately, most of us can also recall teachers who did it very well, consistently, day after day. Furthermore, you do not get students (or anyone else) to feel like they belong by telling them to belong. You do not get students to develop a sense of personal responsibility by telling them to be responsible, nor do you get individuals to persevere only by instructing them to do so. Success and celebration are wonderful things but again, we can all think of learning experiences we have had that included neither. We believe the cornerstone of quality music education’s ability to promote 5-EE learning is engagement in expressive, beautiful music-making. Since 2004, this has been the stated, central aim of the ACG Curriculum: expressive, beautiful, music-making from the very first day. When we engage in a pleasing, creative act, we participate in something greater than ourselves. In that environment, with proper intention, 5-EE learning can occur. In this report we’ll group our activities into three main “buckets”: Systems Building, Empowerment, and Social Service. All these ACG Education activities work together to promote the goal of 5-EE Learning. In 2009, a team of researchers from the University of Texas School of Social Work conducted a study on ACG Education. Students enrolled in our guitar classes at Akins, McCallum, and Crockett High Schools made statements about what the class meant to them, then sorted, grouped, and ranked those statements. That sorting and ranking was analyzed by the researchers to create 3D maps of the concepts to identify what they were and which were most significant—all in the students’ own words. This type of study is known as Concept Mapping. The sizes of the linked concepts do not matter as much as the number of layers. The layers show how significant the grouped statements were considered to be. On this map, the highest ranked concept—with five layers—was “Self-Esteem.” It’s on the left side of the map. The second highest ranked concept—with four layers—was named “Unique Learning Environment.” It’s on the lower right side of the map. Good to have the same teacher over time. 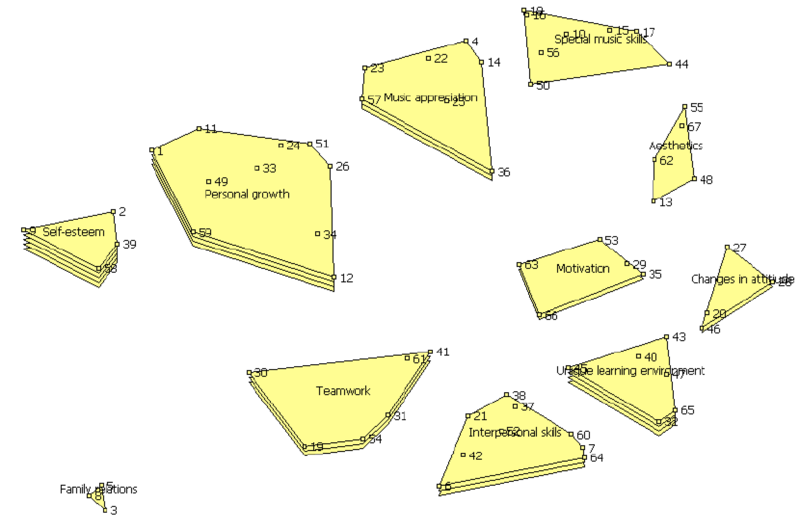 If you compare the statements making up these top two concepts from the UT Social Impact Study with the components of 5-EE , you can see that “Unique Learning Environment” maps quite closely to the first two elements, while “Self-Esteem” maps most closely to elements three through five. GuitarCurriculum.com is the basis for all of our work in ACG Education. Launched in October 2008 after four years in development, this comprehensive online resource for teachers includes a large and growing music library of both ensemble and solo pieces, along with a wide range of materials for improving student musicianship including sight reading and technical exercises, evaluation and testing, video tutorials, and more. Contact us for a tour! 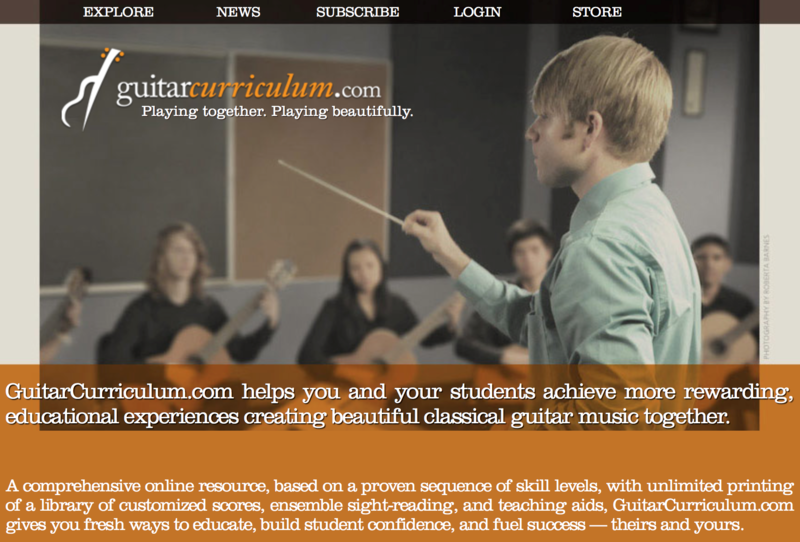 Our big news this year is that, after five years in development, GuitarCurriculum.com has relaunched on a new platform. This is a big deal for us because we have big plans for the resource, but were unable to implement them effectively on the old site. We have also named Eric Pearson, a member of the ACG Education team since 2011, to be our first-ever Director of Curriculum. This dedicated position, combined with the technology capabilities of the improved website, will pave the way for new developments and growth in the years to come. For example, one of the first things we’ll be releasing, perhaps as soon as January 2018, will be an internal user forum. 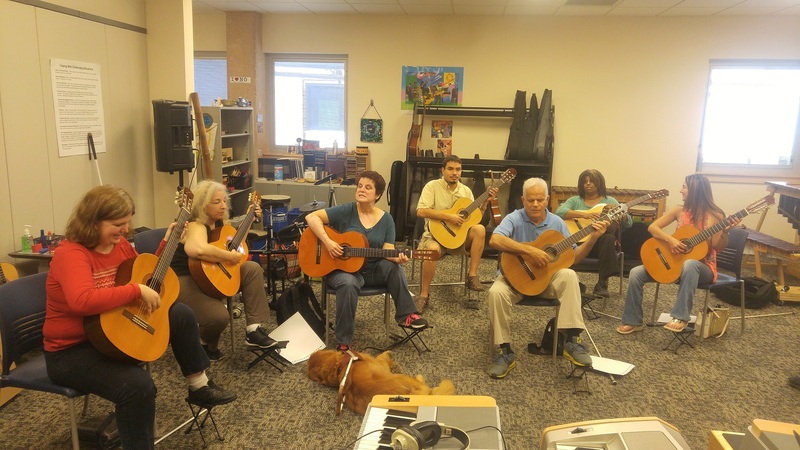 This network will allow serious classroom guitar teachers around the world to connect with a network of other professionals—a particularly valuable advancement in an emerging field where peer support can be difficult to find. Another benefit of our new curriculum website is easy access to usage data. 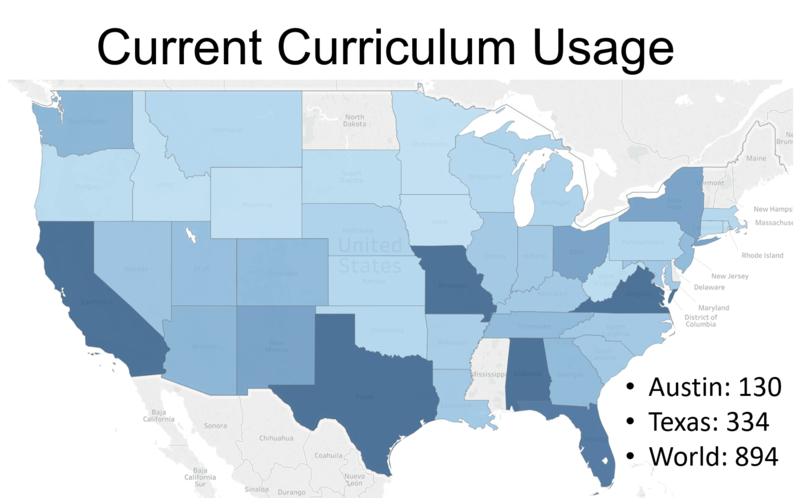 The map above, for example, shows current subscribers in the continental US by state, as well as local, state and global users. Before our new site launched, this type of information was difficult to obtain and unreliable. Other features coming soon include: Increased data collection, automated score upload and license agreement (allowing users around the world to submit pieces to the library), licensing & commissioning, video consultation/feedback, and teacher certification. 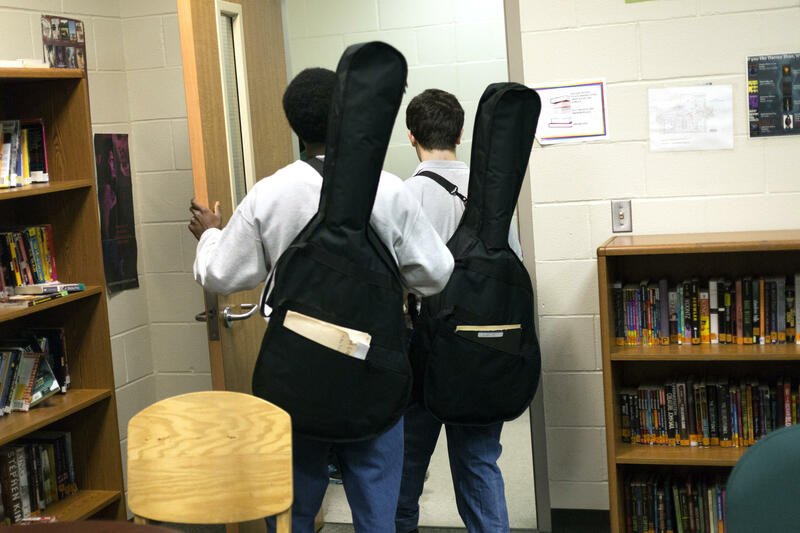 From an assessment and quality control standpoint a top priority has been to set up procedures for guitar at a statewide level similar to those used with established music education programs. For example, in the field of Orchestra Education, there is an Association of Orchestra Directors that advocates and provides professional for orchestra directors, there are district concert and sight reading contests, and city, regional, and state ensembles. These elements help set standards for teachers and students. We created and organized a Concert and Sight Reading event for Austin ISD four years ago. Last year, about 1,000 students participated. Because this event does not exist everywhere across the state, we accept guest ensembles from places like Killeen, Odessa, and elsewhere. We have also helped establish similar adjudication events in Houston, Brownsville, and El Paso. This is a critical piece of quality control in an environment of growth, and will continue to be a priority going forward. 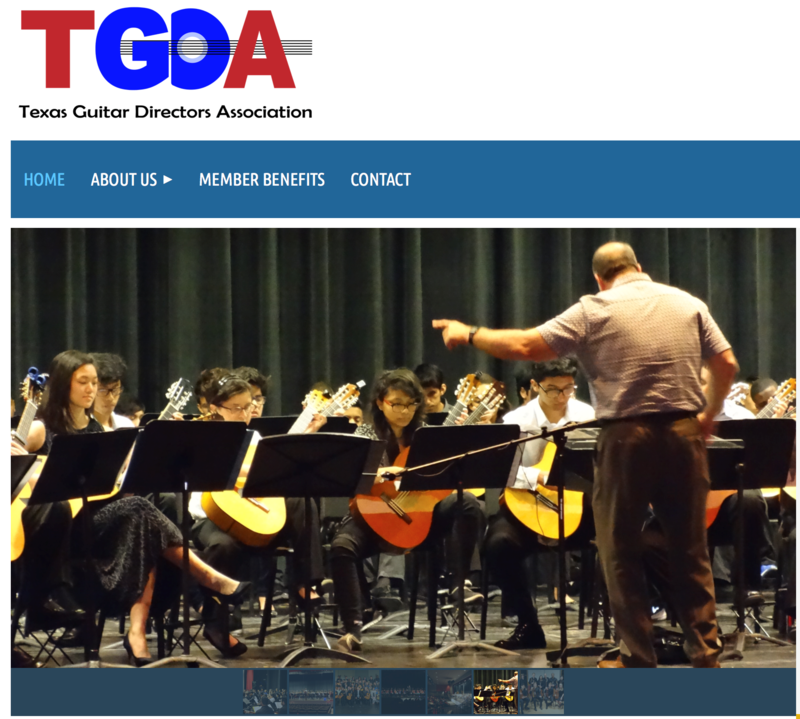 Two years ago we also established Texas Guitar Directors Association. Our plan was to begin the organization, host several meetings, and then hand off leadership to full time guitar directors around the state through statewide elections. We are pleased to report that these elections took place in January 2017, and TGDA is off and running under the direction of its first elected board. The program we helped establish at Texas School for the Blind & Visually Impaired is thriving. Students from TSBVI will open this January’s International Series concert! 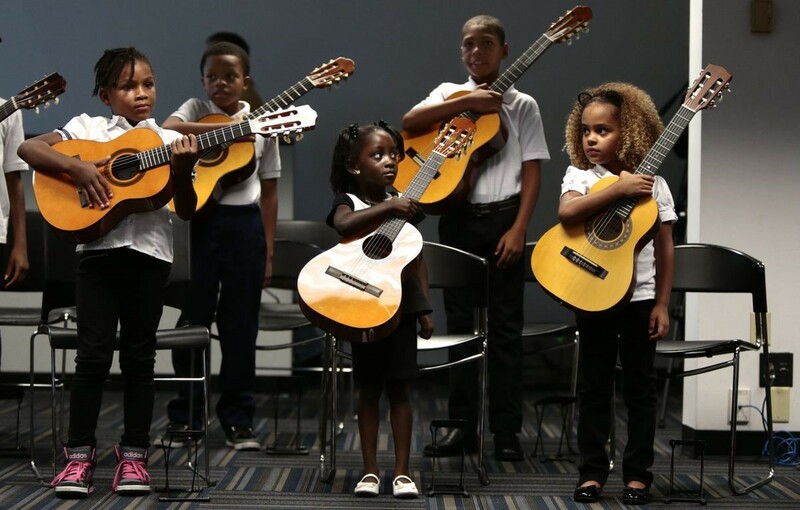 Guitar classes at TSBVI began in 2010. In 2012, we prioritized music literacy, and converted the first lessons from GuitarCurriculum.com into braille notation. Last year, we identified our next priority: the creation of a lifelong learning resource for individuals who are blind and visually impaired. Why? 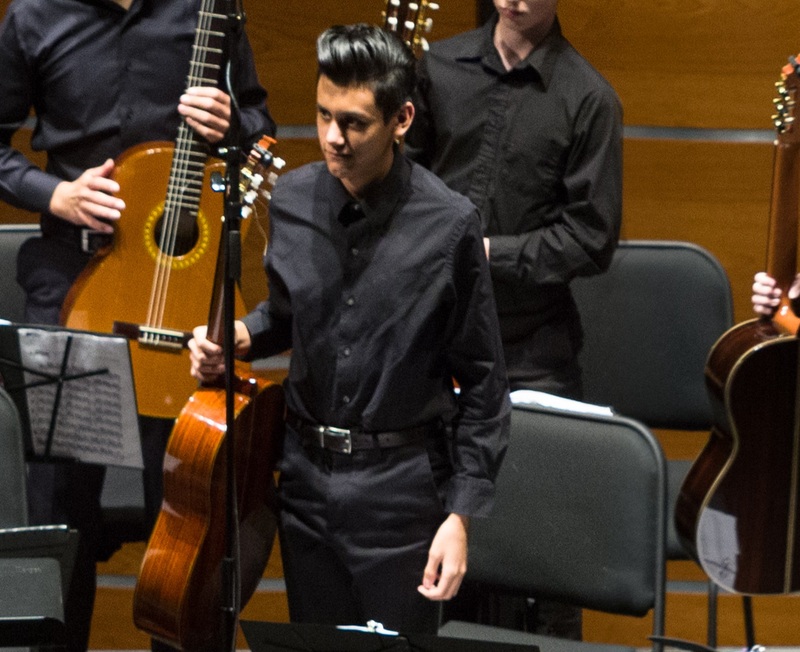 Because nothing like it exists, and because we feel the students who graduate from our program at TSBVI deserve the opportunity to pursue lifelong enjoyment and continued advancement on the classical guitar. In partnership with TSBVI, we envisioned a free, multi-platform, web-based app containing resources for step-by-step instruction in solo guitar, including downloadable braille music scores and accompanying audio guides. Development began in March, 2017, and we plan to launch the app in March of 2018. So stay tuned! The picture above is from a focus group we organized in August with members of the National Federation of the Blind of Texas to try out some of the beginning lesson materials. 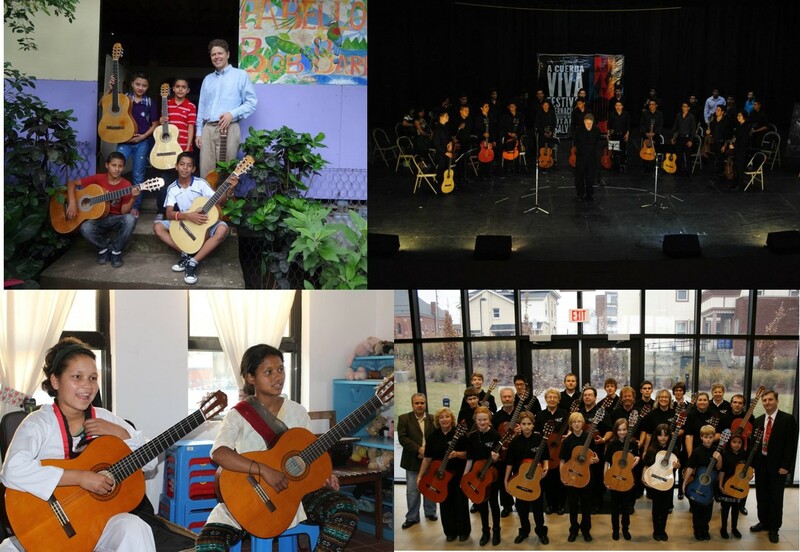 We now proudly offer guitar in all AISD middle schools, all but one AISD high school, and eleven area elementary schools. Our biggest news on the local front is that we were asked by five neighboring school districts to assist with building brand new guitar programs this year: Del Valle, Manor, Dripping Spring, Hays, and Comal. For a complete listing of our central Texas education partners, click here. We have right around 4,000 students in central Texas who played over 300 performances in 2017 for an estimated audience of 25,000 people. 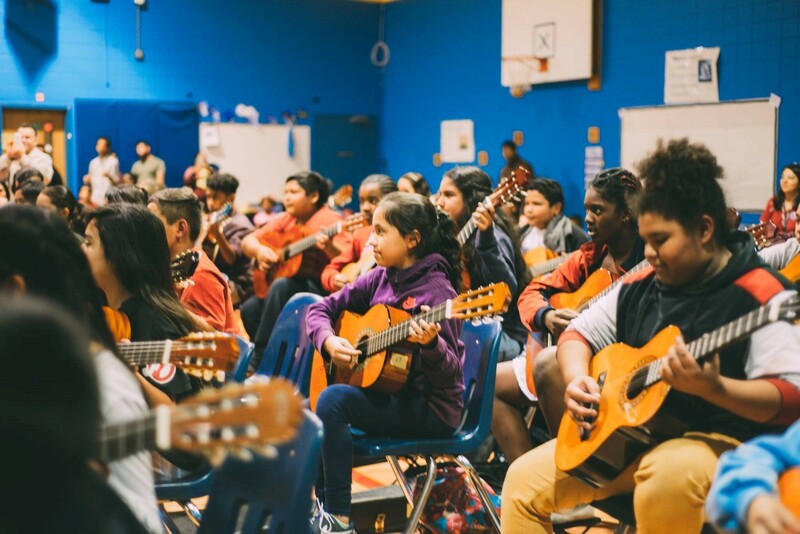 With our existing programs in Austin, we focus our time and resources based on need: Newer programs, as well as programs led by first-time classroom guitar instructors, receive the most attention from our staff, including weekly on-site visits and ongoing consultation and evaluation. For example, we are working with particular diligence right now at LBJ/LASA, where four new sections of guitar were just added this fall, assisting the first-time teacher there with everything from lesson planning to classroom management. And we continue to support every teacher in our Austin programs with free access to all of the instructional resources at GuitarCurriculum.com, complimentary registration to our teacher training workshops, as well as on-site consultation on an as-needed basis. Eighty-five students performed for more than 500 people at the Widén Elementary School winter concert in December. 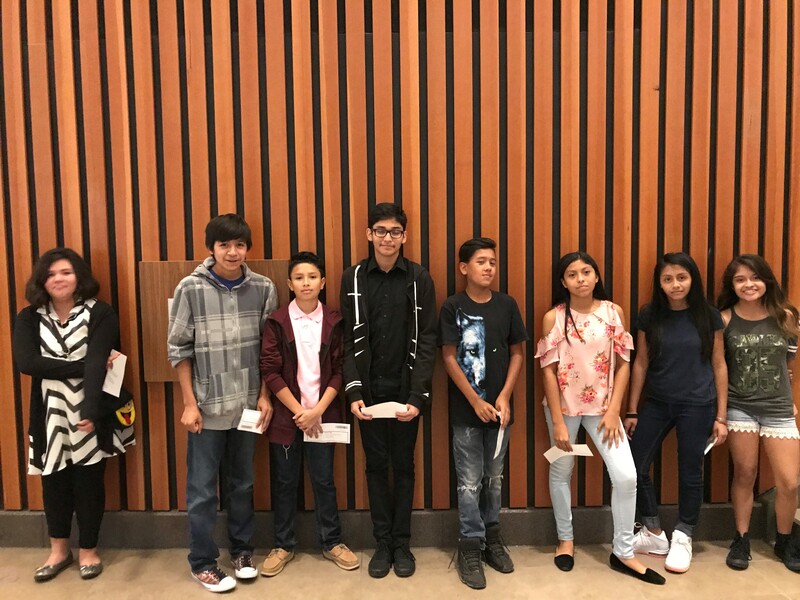 Students from our new program at Decker Middle School in Manor traveled to Austin to be our guests at the Eliot Fisk International Series Concert in November. As you can see from the US map in the curriculum update above, we have many partner teachers around the country. In July 2017, we led teacher training sessions in St. Louis (students pictured above), Cleveland, and Austin. We chose to return to St. Louis and train teachers in Cleveland for the first time because of the highly-motivated and capable partner organizations in both cities. The core of ACG Teacher Training is our efforts to promote expressive beautiful music-making from the very first day, and 5-EE learning experiences of deep, personal significance. This quote below, from a teacher in Canton, Ohio, is a good window not only into the enthusiasm we are encountering and the effectiveness of our program to empower teachers, but it also provides insight into the fact that our teachers need 5-EE learning experiences too—not just their students. The number of curriculum-users from outside of the U.S. has ticked up noticeably over the past couple of years. In some cases, we are providing our international partners with free curriculum and support services — and we’re happy to do so! At our teacher training workshops, we have welcomed guests from the UK, Mexico, Canada, Nicaragua, and Nepal. These are exciting relationships to develop, but—at least for now—international growth is not a top priority in our near-term strategic plan. One of the programs about which we are most proud is our daily, for-credit guitar classes at the Gardner Betts Juvenile Justice Center. Our students there get deeply engaged, achieve impressive results, and perform publicly throughout the year in concerts we organize and as part of swearing-in ceremonies for Court-Appointed Special Advocates (CASA). Contact us if you would like to see one of these—or any other—student performances. The exciting news for our juvenile justice service is that Travis County Juvenile Probation Department has asked us to begin working with youth who are court-involved, but not incarcerated. After designing several models, we have settled on an approach that would enroll eligible youth into our existing school programs, paired with extensive and ongoing individual support from members of our team. We believe this will be a potent combination, and Travis County will award community service credits to the youth who participate. Although it first aired in fall of 2016, we’re including the PBS Newshour segment below about the program because footage inside the detention center is so difficult to attain. It’s also really good! We invite you to watch it with 5-EE learning in mind—particularly at the end. We credit the Lullaby Project, and its creators at Carnegie Hall, as helping lead us to our current mission at Austin Classical Guitar: To inspire individual through experiences of deep personal significance. The Lullaby Project stretched us, and helped us realize that there are many ways music can reach people, heal, and connect. We are particularly excited to begin a new Lullaby Project partnership with Austin Women and Children’s Shelter in 2018, as well as deepen our existing partnerships. We have also began service at Dell Children’s Hospital where we are visiting youth in a variety of circumstances, and may begin lullaby work as well. Here is our newest lullaby, “I Will Protect You,” created in December at the Travis County Jail by Arlen, who wrote it for her four young children. I’d love for you to hear it. Just hit the play button on the video below. There’s also a reflection by Joey Delahoussaye, the Lullaby Project clinician who worked with Arlen to write this moving song. We are humbled and beyond thrilled to report that in November an anonymous donor gave us $75,000 to support our Lullaby Project, $70,000 of which will be held in ACG’s Endowment Fund. This is our second major endowment gift for a social service program. The first was a gift of $45,000 to establish a fund in support of our work in juvenile justice, given by the Houston-based Sue L. Nguyen Trust in the fall of 2016. These extraordinary gifts are so inspiring to our team, and mark significant steps forward in our board and staff’s shared vision of an organization that will continue serving our communities for many years to come. ACG Education actually began in 2001 as an individual scholarship lesson program, before growing into a curriculum and classroom development mission. But the individual scholarship lesson program has continued. Many of our most striking individual success stories have involved scholarship lesson recipients. One such student is Santiago Esquivel, a graduate of Travis High School, who is also our current full scholarship recipient at Austin Community College (we give one scholarship each year). My future goals are to get a music education degree because I want to be a teacher one day. My guitar teacher, Ms. Rosanc, is probably one of the biggest reasons why I stayed in school and stayed motivated. She saw all the potential in me that I didn’t see and I strive to be as good as her. My career goals are to help students who don’t know what they want to do in life. I want to help them find a reason to stay in school and help them find their calling in life even if it doesn’t involve music. I want to help just like my teacher helped me. Santiago volunteered this fall to be one of our near-peer mentors (see below) at Mendez Middle School, and we have also hired him to teach individual lessons at his alma mater, Travis High School. 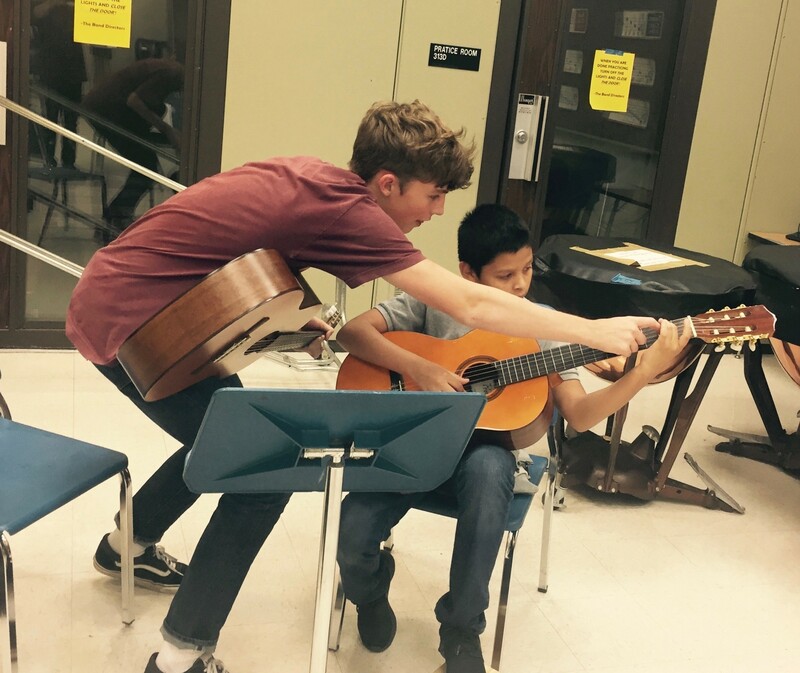 This fall six advanced students from our Austin Classical Guitar Youth Orchestra volunteered to be near-peer mentors at Mendez Middle School as part of a new pilot program. Our vision is that advanced students in all our high school programs will soon be mentoring less advanced students in their high schools or in feeder middle schools. The pilot went well, we learned a lot, and we look forward to taking this program further in 2018. Performance Engagement is an increasingly active part of ACG programming. If you take our core aim of providing experiences of deep personal significance and apply it to performance rather than instruction, then you get a good sense of this program. The interesting thing is that 5EE learning still applies! The more diverse audiences are invited to actively participate as listeners, the more they belong and become empowered as interpreters. 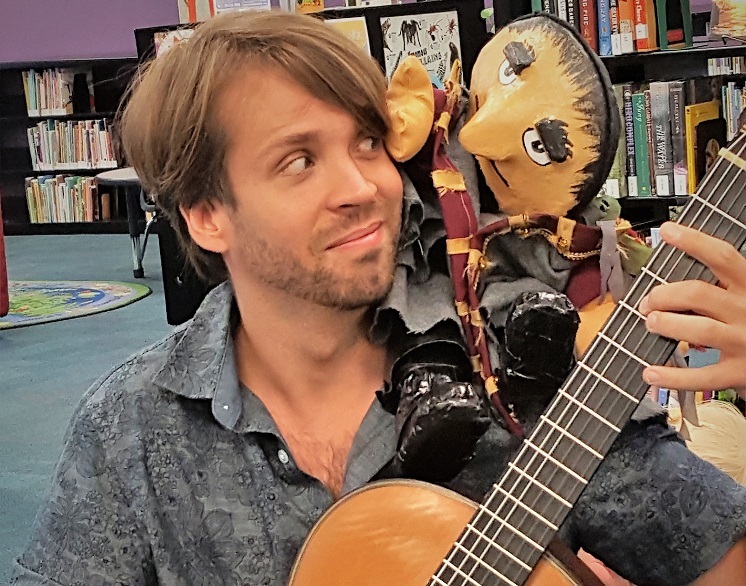 Our Performance Engagement Artist, Joseph Palmer, is constantly innovating in this regard from performing musical puppet shows with Austin Public Library storytellers to devising entire concert programs made up of selections on student contest lists so that as guitar students are listening, they can imagine themselves playing the pieces in contest. For more on this program, click here. This report has touched on our core principles and explored many applications of them. Our top priority is to deliver learning experiences of deep personal significance. We have identified five essential elements (5-EE) that could be summarized as: Belonging, Personal Responsibility, Perseverance, Success, and Celebration. Most of our efforts have been spent on creating resources, training, and models to empower these types of experiences for both teachers and students. We are now investigating an extension of this theory, and we are calling it the Pro-Social Ecosystem. In short, this is a vision of contextualized music learning. Much music instruction is relegated to the music room, practice room, and—once in a while—the stage. We believe, however, that the best way to promote 5-EE learning is through music experiences integrated more fully into daily life. In other words, when students do cool stuff with music, they care more about it, work harder, and it becomes more deeply personally significant. We believe we are particularly poised to provide many meaningful opportunities for this kind of context through service like near-peer mentoring, through collaboration between schools and programs, and through creative opportunities like performing before major touring acts, writing music, or making videos. So stay tuned! We have big dreams in this regard, and we plan to try out some new things in the year to come. City of Austin Cultural Arts Division, Augustine Foundation, Webber Family Foundation, National Endowment for the Arts, the Sue L. Nguyen Trust, Texas Women for the Arts, Rea Charitable Trust, Texas Commission on the Arts, Meyer Levy Charitable Foundation, Sarah & Ernest Butler, Kodosky Foundation, H-E-B, Applied Materials, Louise Epstein & John Henry McDonald, Topfer Family Foundation, The Mitte Foundation, Texas Bar Foundation, Long Foundation, David & Shiela Lastrapes, Mercedes-Benz of Austin, Silicon Labs, 3M Foundation, Kendal & Ken Gladish, Bill & Lynne Cariker, Cain Foundation, the Benavi Family, Oliver Custom Homes, D’Addario Foundation, PricewaterhouseCoopers, Savarez, Urban Betty, Ameriprise Financial, Cain Foundation, Charles Schwab, Dr. Ted Held, MFS Foundation, William Metz, Ted Philippus & Carol Wratten, Austin Bar Foundation, Savage Classical Guitar, Dr. Michael Froehls, Carl Caricari & Margaret Murray Miller, and Bill & Mary LaRosa, Bill & Marilyn Hartman, Michael & Carol Fields, Elaine & Michael Kasper, and Calido Guitars.